There was a lot of competition for who would take us over the 350 billion mark. Who wins the Supreme Protector's Tip of the Hat™ today? The honour goes to Upgrayedd Tivianne, who purchased 100 shares and wins the aforementioned Supreme Protector's Tip of the Hat™. A mightily appropriate bio! 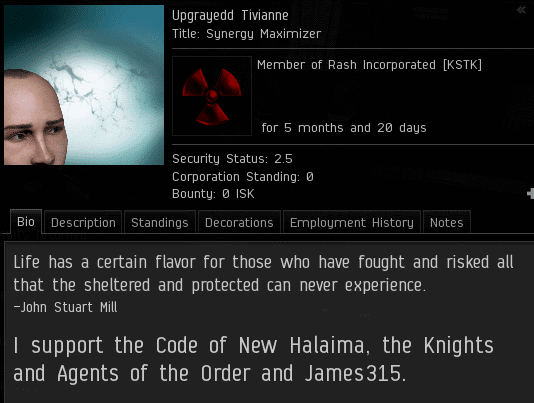 No one fights harder or risks more than the Agents of the New Order. We're not just content creators, we're flavor enhancers. I am a huge fan of this blog, but James is rather ignorant when it comes to the game itself. The use of eve-kill is an obvious example of this. When everyone and their mother has switched over to zkillboard, James is still oblivious to this fact and continues to link eve-kill. I think James would benefit from actually logging into the game and playing it a bit.